Enter to win an eBook from Tess Thompson! Ends 6/14/2013. Females (or "cows") tend to live in family groups, which can consist of one female with her calves or several related females with offspring. Elephants have a fission-fusion society in which multiple family groups come together to socialize. Calves are the center of attention in their family groups and rely on their mothers for as long as three years. I am recently divorced with two small daughters. The morning after we filed divorce papers, I shuffled the children off to school, with their lunches packed and their homework tucked inside their binders and their hair pulled back into neat ponytails. Like a good mother. But inside I was dying. All I could think – just get them out the door so I can collapse, fall apart, stare at the wall and despair. And I did. Like a character from an English novel, I took to my bed. I tried to sleep. But instead I watched the rain falling in slants from a close, gray sky, with the ache in my chest that hurt worse than any physical pain, and my empty stomach turning over and over like my grief was alive in there. Hours ticked by. And then my phone began pinging and ringing and zinging. Engraved on the silver circle were these words: I am a better Me because of you. On the other side: The story of friendship is written on the pages of the heart. I sat on the floor and wept. I cried for my loss but also for the love that was as steady as the rain outside the window. Recently, I had a disappointment with a man I was newly dating and really liked. It was my first venture out into this wilderness called dating but I had a lot of hope for the relationship turning into something meaningful. Alas, it is not to be. And as much as I tried to be stoic and mature, I could not keep the tears at bay. The ache in my chest was back. My empty stomach turned. But I did not take to my bed. Instead, after I got the children off to school, I called my friends. I stood at the window, the rain falling in slants, and I told them every detail, holding my necklace between my thumb and index finger. They listened. They advised. They sparked to anger. They hurt because I was hurting. And their kind voices on the other end of the phone were a salve to my hurting heart. My community, once again, kept me from the darkest of places. Community. Friendship. A pack. A gang. A flock. It is all that matters in this hard and unpredictable life. They’re the light on your darkest days and your cheer squad on the days when joys fall upon you like rays of sunshine from heaven. The power of community is a central theme in both my River Valley books, Riversong and Riverbend. The experts say to write what you know. I surely did. 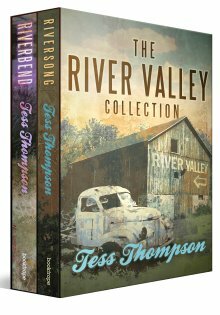 In the first two novels of The River Valley Collection, bestselling author Tess Thompson (formerly known as Tess Hardwick) assembles a colorful cast of endearing small-town characters and takes you on two journeys that will make you believe in the possibilities of life and renew your faith in love, friendship and the power of community - even in the face of unimaginable grief. A surprising mix of romance, humor, friendship, intrigue and gourmet food - The River Valley Collection entertains while reminding you of life's greatest gifts. When Lee Tucker's husband commits suicide, he leaves her pregnant and one million dollars in debt to a loan shark. Out of options, she escapes to her deceased mother's dilapidated house located in a small Oregon town that, like her, is financially ruined, heartbroken and in desperate need of a fresh start. Lee's resilience leads to a plan for a destination restaurant named Riversong, to new chances for passion and love, and to danger from her dead husband's debt as her business blooms. Lee Tucker is the kind of woman you find yourself rooting for long after the last page is read. Tess Thompson is a novelist and playwright with a BFA in Drama from the University of Southern California. In 2011, she released her first novel, Riversong, which subsequently became a bestseller. Like the main characters in the River Valley collection, Tess is from a small town in Oregon. She currently lives in a suburb of Seattle, Washington with her two young daughters, Emerson and Ella, and their puppy Patches. Visit Tess at www.tesswrites.com.